After watching six hours of enormous, scantily clad men grab and slap one another my mind was struggling to digest all of the activities. With so many ceremonies, pre-fight formalities, and balanced posturing it seemed as though I just left a theatrical performance not a heavyweight wrestling match. That's sumo - five minutes of pre-fight theatrics ranging from drinking water to stretching to squatting and staring followed by ten seconds of pushing. Because of all the time spent on the pre-fight formalities it seems the matches are won before the combatants launch into one another - whoever wins the stand offs, stare downs, and posturing wins the match. As soon as you think the action is about to start the wrestlers back off and return to their respective corners for another round of high leg stretches. 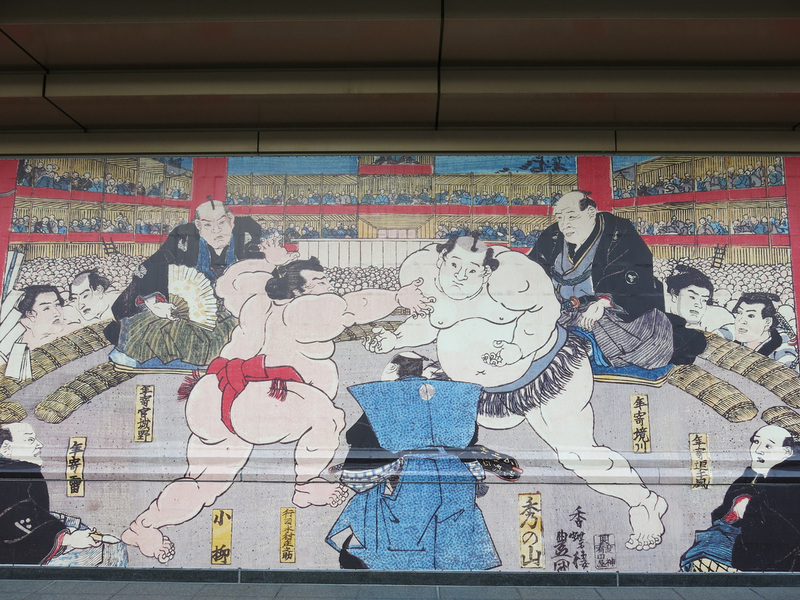 Six national sumo tournaments are held every year - three in Tokyo, and one each in Osaka, Nagoya, and Fukuoka. The tournaments last two weeks. There's not too much, if anything, you really need to know before attending and being able to appreciate the event. Basically two huge men enter a ring - the first one to be pushed out or touch the ground, other than with their feet, loses. It's a one and done scoring system. The more you watch the more you can see there is strategy involved and matches are not simply a case of which wrestler can hit the hardest. The best technique I saw was when the defending wrestler would use his opponent's aggression against him - the aggressor would launch, the defender would quickly step to the side, and the aggressors momentum would send them right out of the ring. I arrived early on the first day of the September 2014 sumo match in Tokyo. There are three match levels starting with the lowest ranked wrestlers and ending with the highest rank wrestlers. Since the first and second level of matches are of low and medium quality there was no one in attendance and I was able to sit where ever I wanted for the first few hours. Once the final group of wrestlers entered the ring area the stadium filled up and I had to sit in my up high ticketed seat. Even from way up in the top section the match was exciting. For all the aggression and pushing in the ring the highlight of attending a sumo match may actually be entrance ceremony. 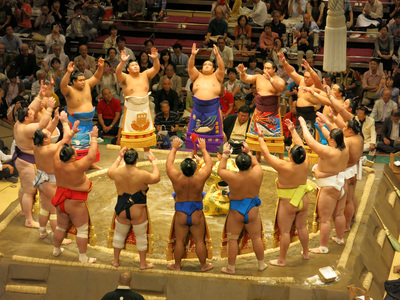 Before the start of a new level of matches all the wrestlers competing at that level enter the stage area, are introduced, and line the circle of the ring. Each wrestler wears a colorful wrap and seems intensely focused on their upcoming match. There a few more individual wrestler theatrics to pump up the crowd. 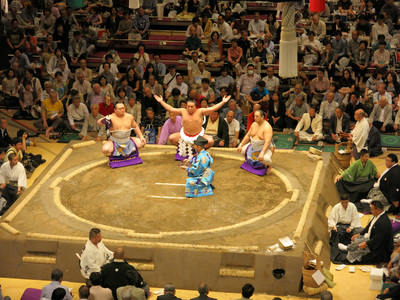 Then wrestlers start to arrive at the ring and begin the pre-fight formalities. For all the time spent on the rituals and ceremony the fights don't last too long. Most are over in less than fifteen seconds. If the match continues beyond the initial furry the wrestlers lock onto one another and do a bit of a slow dance and jostle for position. 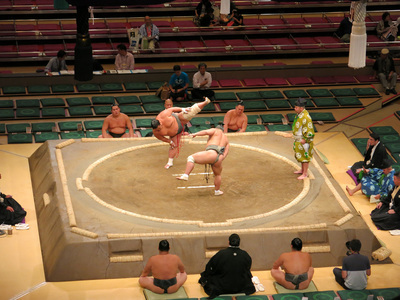 There's a standard routine each wrestler performs before they enter the ring. Once they are in the ring there is a squat, stretch, and stare down - if one of the wrestlers feels uncomfortable they will stand up and return to their corner. As the quality of the matches rose so did the pre-fight antics. If you want to see the formal routines performed before entering the ring here's a short clip: PRE-FIGHT FORMALITIES. There are six national sumo tournaments a year - given the uniqueness of this event and how interesting it is to attend you should strongly consider scheduling a trip to Japan that coincides with when the tournament is held. 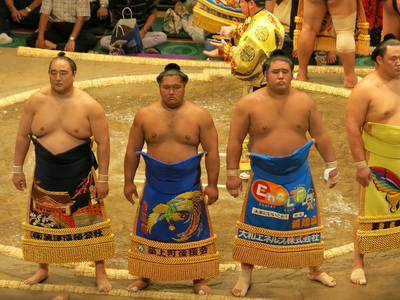 To see an upcoming schedule visit Japan's Official Sumo Wrestling Site. I ordered tickets online through a third party agency: www.buysumotickets.com They are endorsed by Lonely Planet, etc. and I had no complications with receiving my ticket information. Since I was already traveling I had the agency send me an electronic ticket - to redeem the ticket I needed to present a printout to the cashier at a 7-11 who then printed my official ticket - it's less complicated then it sounds. You may be able to purchase tickets at the stadium but there's no guarantee - you can also expect the first few days and last days to be sold out if you wait too late. Tokyo's Ryogoku Kokugikan Stadium is fairly intimate so wherever you sit you will have decent views. Seats on the ground floor are limited to "boxes" and the complete box must be purchased. Individual tickets are only available for the upper level. There are four people sitting on a mat in each box. The way the stadium seating is structured Individual Tickets in Section A are closer to the main ring then the Box Tickets in Section C - however, you have an overhead view versus eye level view. Upper level Section A tickets are only 10-13 rows closer then Section C tickets but it's actually a much better view. The A tickets are nearly double the price of the C tickets, however, I think it would be worth the upgrade if you don't arrive early and sit in the open seats before the rest of the crowd arrives. If you only wanted to attend the highest level event I'd purchase the Upper Level A tickets. Also...since the stadium is square shaped you will want to make sure you are in the center of the stadium - a B Level center seat will be closer to the action then an A Level corner seat. I'm not sure that anyone side of the square is better then the other - they all have their advantages and disadvantages. I was able to move around freely until the final round. There's not much in the way of concessions at Ryogoku Kokugikan Stadium but you are able to leave and re-enter the stadium once during that day's matches. In between the matches I watched the wrestlers arrive via taxi - the wrestlers may be limber in the ring but it's a bit of a struggle for them to exit a taxi. 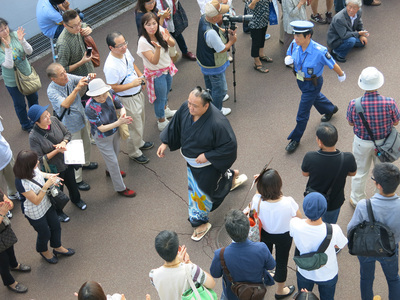 Crowds gather and formed an aisle for the sumo wrestler to walk from the taxi to the locker room. Afterwards some wrestlers would loiter around the concourse and tower over everyone. 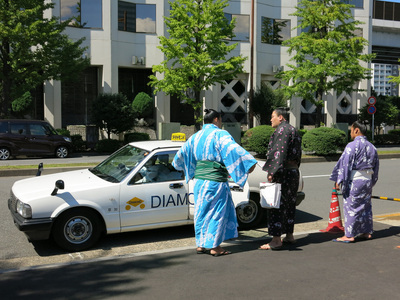 For additional Sumo photos see FLIKR ALBUM.